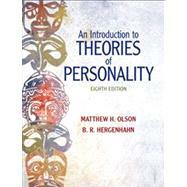 This introduction to the theories of personality introduces readers to the rich history of psychology and practical information that helps students understand their own lives and their relationships with others. Using a theorist-by-theorist approach, this text summarizes the major theories of personality and emphasizes that the best understanding of personality comes from a variety of viewpoints. Theories representing the psychoanalytic, sociocultural, sociological, and existential-humanistic paradigms are offered as different--yet equally valid--ways of approaching the study of personality. Theorists covered include: Sigmund Freud, Carl Jung, Alfred Adler, Karen Horney, Erik H. Erikson, Gordon Allport, Raymond B. Cattell and Hans J Eyserick, B.F. Skinner, John Dollard and Neal Miller, Albert Bandura and Walter Mischel, David M. Buss, George Kelly, Carl Rogers, Abraham Maslow, and Rollo Reese May. For anyone wanting a comprehensive understanding of personality and individual differences. Matthew Olson earned his undergraduate degree in 1973 at The University of California, Davis, and completed his PhD in Experimental Psychology at The University of Michigan in 1977. He joined the faculty at Hamline University in Saint Paul, Minnesota in 1977, where he continues to enjoy teaching undergraduate students and writing. B. R. Hergenhahn (1934–2007), Professor Emeritus, Hamline University.